What does ‘wanderlust’ mean to you? A picture-perfect beach getaway with a margarita in hand? A romantic rendezvous? A business trip not at a cookie cutter hotel? A culinary escape or girlfriends getaway to a property with an onsite vineyard? How about an adrenaline-pumping volcano helicopter tour or a relaxing solo trip to a luxury spa inn? Much like B&Bs, no two people are alike, especially when it comes to traveling and individual getaway desires. In response to the ever diversifying needs for unique and fresh travel experiences, guests may be surprised at how innkeepers are keeping up with travel trends – and setting new ones – through the specials and packages that they offer. Whether you want a once-in-a-lifetime adventure, outdoor escape, relaxing babymoon, spa retreat, or a quiet mid-week staycation, our B&Bs have you covered with unique and exciting specials that prove the bed and breakfast experience is one where you wake up someplace special. Bed & Breakfast Specials offer more than just a good deal; they offer experiences. Travel Like a Local. Innkeepers have the inside scoop on where and when to go, what to visit and what to avoid, local cuisine and more. Unique Wedding, Vow Renewal and Honeymoon Options. There is nothing cookie cutter about the experience. Exchange vows on a beach, lakeside, in front of a roaring fire, overlooking a lush garden, whatever your heart desires at a fraction of the cost of hotel venues. Quick To Learn. 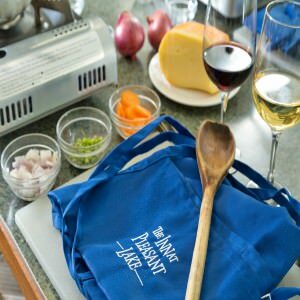 Cooking classes, photography classes, and beer brewing classes are just the short list of what you can learn, and courses and classes offered by innkeepers and local experts. Wake up someplace special. B&Bs are more than just a place to sleep, they are travel’s best kept secret! To find bed & breakfast specials, click to the inn’s website from BnBFinder.com and look for a Specials and Packages tab — then get ready to save, savor and enjoy!